Therapy Dogs - What They Do And How To Get Involved! Therapy Dogs Are Amazing Animals Who Work Alongside Their Handlers To Improve The Lives Of Others. Is Your Pooch Calm, Laid Back And Very Friendly? Then Read On To Find Out All About How You Can Get Involved In The Wonderful Work Of Therapy Dogs! Let’s take a look at what therapy dogs really are and what exactly they do. Find out who you could be spending your spare time with, and whether you think it sounds like a fun or rewarding experience that would suit you and your dog. If you decide the work of therapy dogs is for you, we’ll also take a look at how to get involved. But first that all important question – what exactly are therapy dogs? Therapy dogs are volunteers, who work alongside their owners to support people. They are pet dogs, who spend some of their free time visiting people. The setting for these visits is usually in hospitals, hospices, nursing homes, schools or community centers. 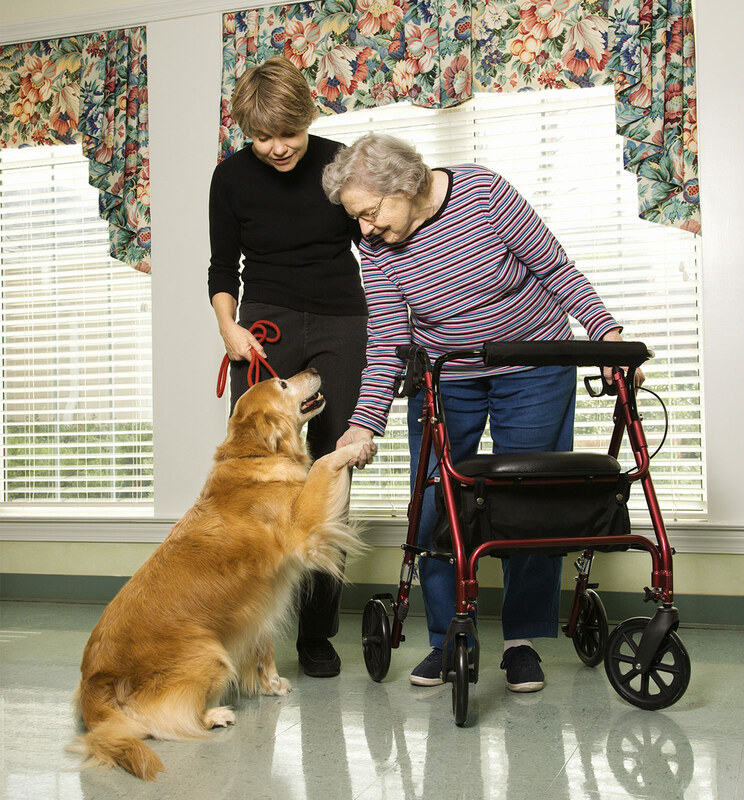 Therapy dogs’ main role is to provide affection, support and comfort to people who need it. They are not usually the same as service dogs or assistance dogs. 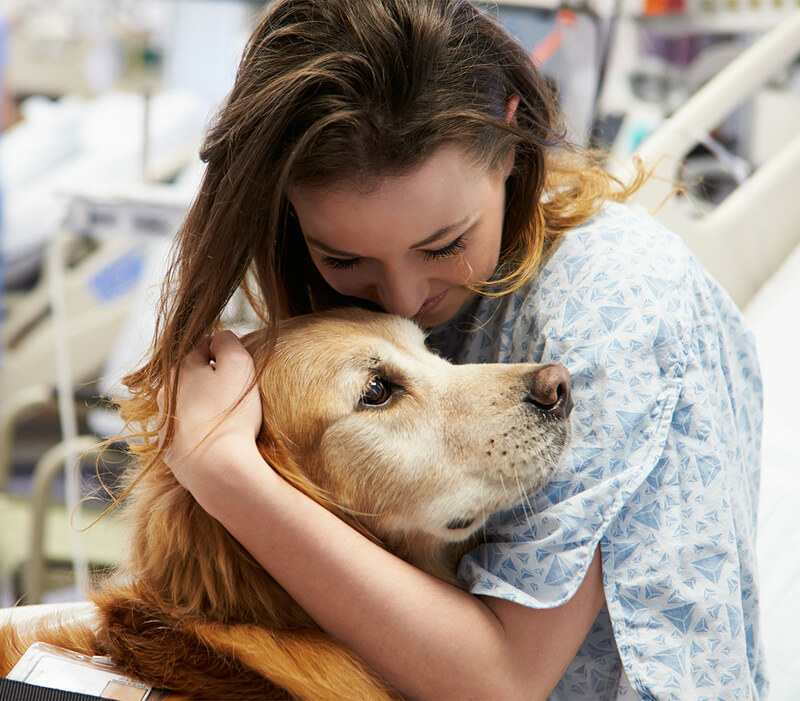 Therapy dogs provide emotional support rather than practical physical aid, to the people they come into contact with. Who do Therapy Dogs help? 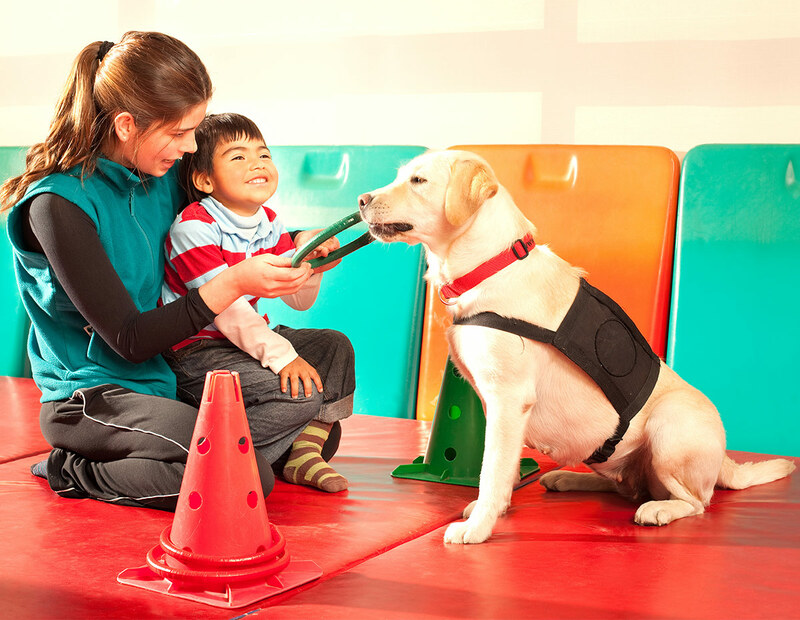 The people you and your therapy dog will meet will depend upon where you are employed. The locations usually involve people who are vulnerable in some way, and in need of emotional support, comfort or just a distraction from there situation. Different settings will be best for different types of dogs, and personalities of owners! Let’s take a look at some of the options.. If you bring them to your local hospital, patients could be of a range of ages, suffering from any number of illness or ailments. And enjoy chatting with whilst they make a fuss of your dog. They may be very unwell and finding it hard to physically interact, but be comforted by the presence of a pet, or the feel of his head resting on their hand. Hospices are environments who care for the terminally ill. These scenarios can involve dealing with people who are nearing the end of their lives, or helping to support their families through this incredibly difficult time. The charity who trains you will prepare you for the circumstances you are likely to come into contact with, relevant to where you will be taking your dog for his therapy sessions. Elderly people staying in nursing homes are at risk of becoming lonely and depressed. Your therapy dog will visit them to be petted, hugged and interacted with. This doesn’t just give the residents something to look forward to. It also helps them to relax, quietly receiving comfort from your therapy dog or gaining some conversation and company from you in the process. Having someone new to talk to and a soft, friendly face and wagging tail to brighten up their day. If you bring your therapy dog into a school then of course the majority of the people you will meet will be children. Their ages will depend upon the school, but they could be anywhere between 4 to 16 years old. 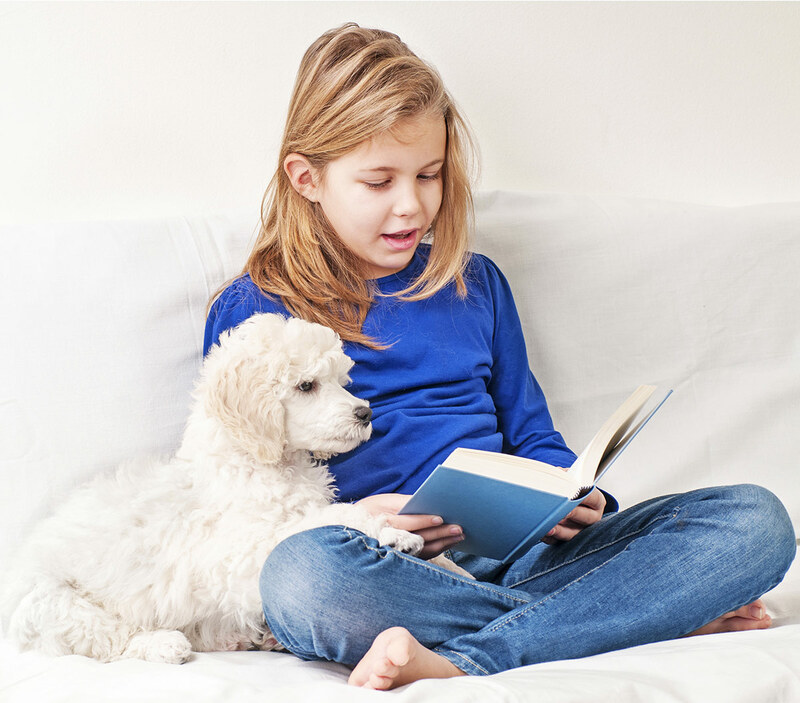 Literacy programs are cropping up around the United States and UK where children are helped with learning to read by the company of calm therapy dogs. They are also prized in schools for kids with special educational or emotional needs. If you become involved with a community outreach program then the people you visit can vary considerably. They may be people in need of emotional support, who have suffered loss or loneliness, or who require special care. Whoever you get involved with, the group you and your dog train with will help you to get to grips with the scenarios you will face. 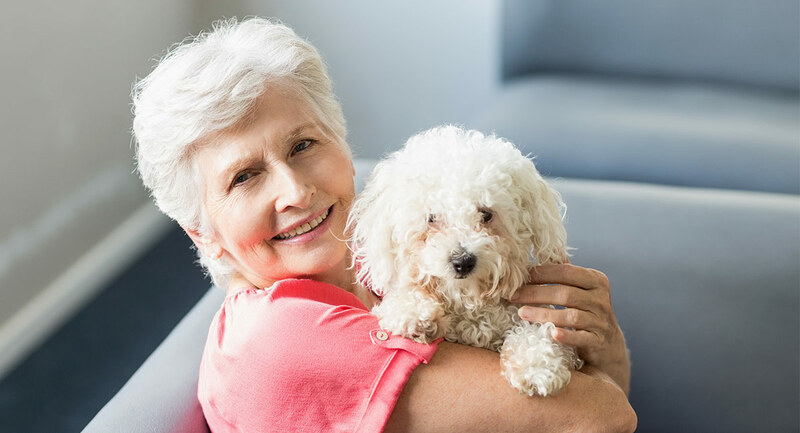 Familiarizing you with appropriate ways to behave, and setting you and your therapy dog up to do a great job supporting those who really need some extra comfort from a fluffy friend. Could my pet be a good Therapy Dog? 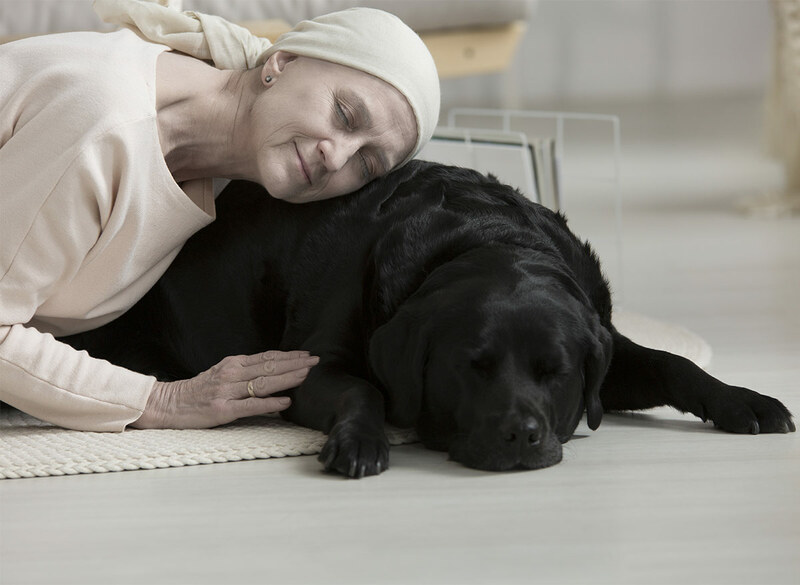 Labradors are a popular choice for many types of therapy dogs. But there are huge numbers of breeds that excel at the task. There are specific requirements for therapy dogs with regard to temperament, but many pets would fulfil these. Obviously a therapy dog that will be mixing with vulnerable people and therapy dogs must be calm and friendly, with no trace of aggression. 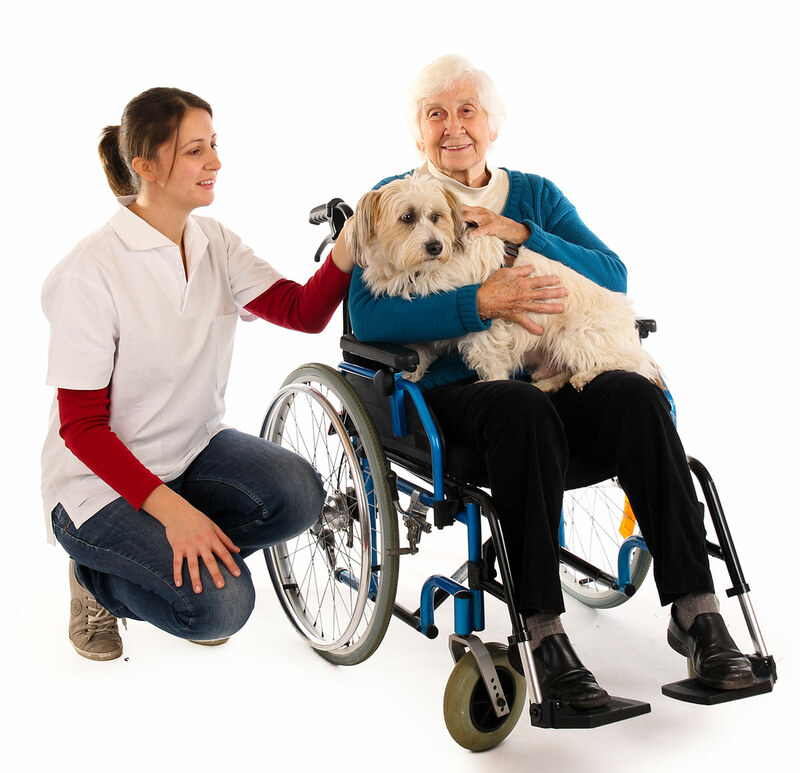 Disabled and ill people do not always behave in the way that a dog expects them to, and therapy dogs (and their owners) must be able to cope with unusual behaviour. Your dog will need to remain calm in the presence of movements, noises and actions that are out of the ordinary. He must also be able to be interacted with and spoken to in any way without becoming anxious or getting too excited. Each therapy dog is accompanied on all visits by their owner and therefore you will need to provide evidence that you too, are of good character! Who Arranges Therapy Dog Sessions? Therapy dog sessions and training are arranged by dedicated charities, who work with owners of particularly friendly and laid back animals. In the USA there are a number of different charities who arrange therapy dog work, with recognition being given to them by the AKC’s Therapy Dog Program. In the UK therapy pets are organised by the Pets As Therapy charity. The system you will need to follow will differ depending upon where you are located. Let’s start by looking at how to get involved in the USA. In the USA there are a number of charities who work with dogs and their owners to give therapy to those in need. If you think your pup would suit therapy dog work, and have the time available to give up to accompany him on this work, then the first thing you will need to do is find your local therapy dog charity. We have gathered below a list of charities, institutes and organisations involved in therapy dog work in the United States, arranged by State. Clicking on their name will take you to that organisation’s website, and further details about how to get involved in your area. If your state is not on the list, then we haven’t yet come across a therapy dog organisation in that area – but that doesn’t mean there isn’t one! Contact the nearest you can find, and they should be happy to point you in the right direction. The AKC are not involved in training and organising therapy dog work, but they do offer a recognition scheme. The purpose of this scheme is to reward and encourage owners of therapy dogs who give up their time to help others. They provide awards based upon the number of visits that you and your dog have carried out. The milestones worked to are 10, 50, 100, 200 and 400 visits. In order to reach these goals you will have to have given up a lot of your time to assist others, and people find it very motivating to have a target to aim towards and recognition when they reach it. In the UK therapy dogs are arranged and rewarded under a different system. The first step towards becoming a PAT dog is for you to register an interest with them through their website. “I went on the website www.petsastherapy.org on the volunteers section and found details of my local contact and rang her to ask a few questions, then I went back onto the site and requested an application pack. I then had to ring to find my nearest assessor to get Barney assessed for suitability. The dog must be over 9 months old, healthy, and to have lived with you for over six months. They must turn up to be assessed on normal collar and lead. Halti dogs aren’t ready to be PAT dogs. The assessor looks at a range of behaviours such as reaction to sudden noise eg someone drops a crutch, being handled or groomed, grabbed suddenly, how they take treats and so on. We were there about 30 minutes. Carole points out that Pets as Therapy do take up references. You should expect to wait up to twelve weeks for a response. Carole was thrilled to learn that she and Barney had been accepted after a two month wait. They were then sent their pack containing handbook, id card, id tags and details of their local contact who emailed Carole a list of places to visit. Who are Pets As Therapy (P.A.T.)? In the UK therapy dog work is arranged by the charity Pets As Therapy (P.A.T.). In this country, therapy dogs are frequently referred to as ‘PAT dogs’, for this reason. Pets as therapy was established in the 1980s. It enables residents in care homes, hospitals, hospices etc, to benefit from the pleasure of contact with suitable cats and dogs. According to the P.A.T. website, there are currently over four thousand active P.A.T. dogs (and over a hundred cats) in the UK who between them visit a staggering 130,000 people each week. “It was up to me which one(s) I pick. You then set up an initial meeting to find out if it’s somewhere you’ll both enjoy visiting. The list on my area was mainly residential retirement homes, a few nursing homes and a special needs school. Uniform is optional but Carol ordered the full kit – collar, lead & jacket & t shirt for Carole. Both Carole and Barney have photo id already plus Barney has a little P.A.T. tag for his collar. Carole has now been given a list of places on the waiting list for a P.A.T. dog visit. There are 22 within 5 miles of her home. Apparently compared with many areas that’s a short list. Most have been waiting for years – and four on the list have been waiting since the year 2000. Obviously there is a great deal of demand for this valuable service, and it is likely that many more people would volunteer if they knew about it. How much time P.A.T. dog owners contribute is up to them. Carole decided to do 1 hour a week at first to see how she and Barney get on and how he copes too. She intends to spread herself around by going once a month to 4 different places. Pets As Therapy need more volunteers with nice dogs! If you think that volunteering as a P.A.T. dog is something you and your dog would enjoy, contact Pets As Therapy for more information. There are hundreds of people out there just waiting for a visit from your lovely dog! But if you think it wouldn’t suit your dog, you can still help them with your donations or volunteering for other roles within the charity.